The thing about Instagram is that trends are usually spreading like wildfire all across the platform. 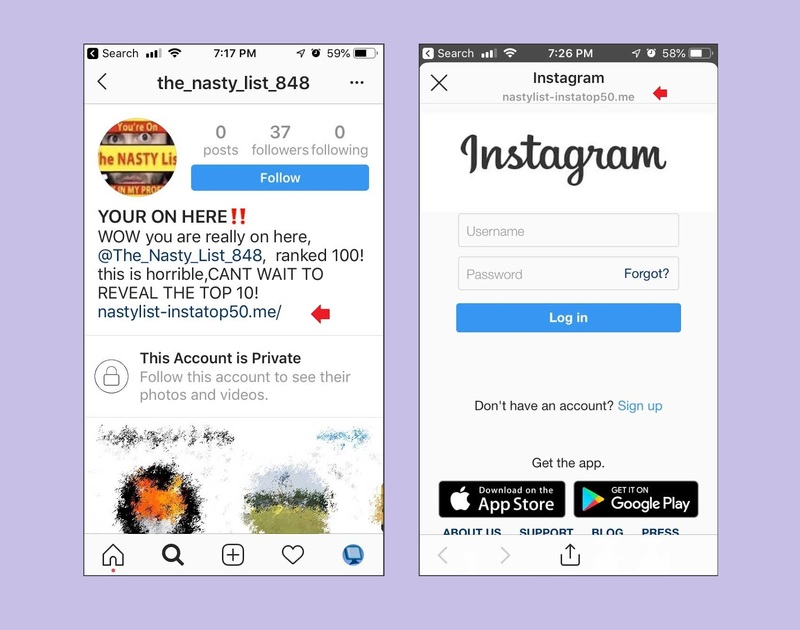 This is one of the reasons why so many people love using it on a regular basis, but the fact of the matter is that a lot of the users that tend to use Instagram like this need to know about a little thing called the Nasty List. The way that the Nasty List works is that you get a message with a link to what is ostensibly a Nasty List for Instagram, which is basically supposed to be a list of users that have done strange or off putting things. If you click on the link, you will be taken to a login page that looks like the login page for Instagram. You will be asked to log in before you can actually look at the various entries in the nasty list, and when you enter your details (i.e username/email id and password), hackers are going to be able to steal these information. Also read: Hackers Are Constantly Attacking Your Favorite IoT Devices With Login Attempts - A Comprehensive Research Proves! This is because of the fact that the login page that you are going to be taken to does not actually belong to Instagram, it is just a front put up by hackers that are going to make it so that you would end up trusting the page and putting in your account details. This is a very common phishing technique that a lot of hackers tend to use in order to make the most of the kind of information that they are trying to obtain from a particular platform. You should be wary of such tricks because of the fact that it can sometimes end up compromising your security on the internet all in all. Read next: Instagram Is Testing "Post Reactions"